Even with the best future and financial planning, making college affordable these days can be a challenge. Even with the best future and financial planning, making college affordable these days can be a challenge. For tennis players, there are a variety of avenues that may be able to help soften the financial burden. Whether in the form of athletic scholarship, academic merit aid, or need based financial aid, there is hope for getting some financial support to be a collegiate scholar-athlete. A good place to start understanding the world of financial options in college tennis is with a definition of terms. A “full ride” is a tennis scholarship offered by a coach at a university which will cover all tuition, room and board at that university for the duration of a player’s tenure. Most student athletes complete their undergraduate education in a four year span, and the scholarship is committed to that time period unless major infractions occur which can give the coach reason to remove a player from a team. In some special circumstances, scholarship may cover a fifth year to account for a red shirt year (due to injury or some other unique circumstance) or in pursuing an academic route which may require 5 years to complete. It is important to know that full rides may not cover every cost of attending an institution (for example, travel to and from the school each semester, extra spending money, etc.). Alternatively, some schools in the “power 5 conferences” (ACC, Big Ten, Big 12, PAC-12, SEC) may offer “cost of living” stipends in addition to the athletic scholarship. So, the message is to be aware that even “full ride” arrangements may vary from school to school, conference to conference, and division to division, so it is important to discuss and understand the small print details when agreeing to a scholarship arrangement. Once a tennis scholarship is verbally committed to, most scholarship recipients will then be required to sign a NLI (National Letter of Intent) in one of 2 signing periods – fall or spring of senior year – which is a written contract intended to protect both the school and player in their scholarship agreement. A “fully funded program” is a tennis program which offers the maximum number of scholarships that the NCAA allows for college tennis. Fully funded women’s programs have 8 scholarships and fully funded men’s programs have 4.5 scholarships. Often there is the assumption that all Division 1 programs are fully funded and offer full scholarships for the majority of the team; however, Division 1, 2, and NAIA schools which are allowed under NCAA terms to offer scholarships may offer the maximum number of scholarships, a portion of that amount, or none at all. For example, the Ivy League schools, while Division 1 in the NCAA, are precluded by their conference rules to offer athletic scholarships, so no Ivy League student attends their institution on an athletic scholarship. Additionally, families are often surprised to find that some other prominent Division 1 schools that offer scholarships in other sports (for example, Villanova, Georgetown, and Colgate) don’t offer tennis scholarships. And, in another wrinkle, there is also the situation at some Division 1 schools (Boston College and Boston University being two current examples) where the women’s tennis program is fully funded with 8 scholarships and the men’s program has no tennis scholarship money at all. Broad assumptions about the level of funding for tennis programs can be detrimental in pursuing the right type of institution for a player’s financial needs, so any recruit going after scholarship money should be clear on the status of programs of high interest before getting too far down the recruiting road. A “partially funded program” is a tennis program which does offer scholarships, but offers fewer than the maximum allowed by the NCAA. Not every school offering scholarships is required to, or may be able to, offer 8 on the women’s side and 4.5 for men’s teams. For example, a partially funded women’s program may only be budgeted for 3.5 scholarships, or a men’s team may only be able to offer 1 scholarship. In the case of partially funded programs, coaches usually have discretion with regard to how those monies are dispersed. A coach with 3 scholarships, for example, may decide to award the 3 top players full scholarships while other players are not on scholarship, or that coach may decide to spread the 3 scholarships among several players. Understanding the team’s scholarship status, and how the coach manages the scholarships, is important when assessing the probability of getting a tennis scholarship at a particular school. “Merit aid” is scholarship money based on a player’s proven academic success in high school. Many colleges will have prescribed formulas for getting merit aid which are based on GPA and test scores. While there may be some exceptions, most colleges will allow merit aid to be added to athletic aid to construct the full financial aid package. This emphasizes the importance of a strong high school performance in the classroom as it can translate to more merit aid, and if dealing with a partially funded tennis program, it may enhance the ability to put together a larger overall scholarship package. Usually, during the early read process in which a coach submits a recruit’s academic information to get a sense of admissibility, a determination of expected merit aid can be provided as well. For coaches at partially funded programs, a strong academic candidate may be even more attractive as a recruit since they may have to spend less of the tennis money to get a player to full scholarship status, allowing for more flexibility of those funds for other strong players to enhance the team. It should be noted that merit aid cannot be added into the mix if someone is awarded a full ride athletic scholarship. Schools that do not offer any athletic scholarships (most commonly Division 3 schools and some Division 1, 2 and NAIA schools) may or may not offer merit aid. The schools most likely not to offer merit aid are the most elite academic institutions with low acceptance rates which attract top students without the need to add the enticement of academic merit aid. Additionally, with most accepted students at those institutions having top of the line academic credentials, there is little to distinguish those who deserves merit aid from those who don’t, so there is no merit offer for anyone. Whether a school provides merit aid is a question that needs to be addressed directly with a coach at any non-scholarship school. Other financial aid may come in the form of “need based” financial aid offered by colleges. Qualifying for this kind of aid usually involves submitting the federal FAFSA forms which will use items such as income, tax brackets, family expenditures, etc., to calculate the demonstrated need of a family to afford college. 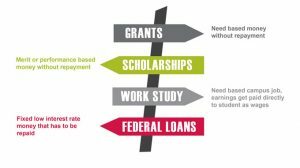 A college may provide all, or a portion of, that demonstrated need in a variety of ways: grant form which does not need to be repaid, low interest loans, or programs like work-study (in which a student has a campus job and their payment is applied to the school cost). By law, colleges and universities are required to have a financial aid calculator available (usually on their websites) in which families can input general information to get a ball-park sense of their expected costs. Finally, other aid can also include scholarships unrelated to the FAFSA process. Geography can often play a part in recruiting talented student-athletes to some college campuses, so be sure to ask a college’s financial aid office or Admissions department whether there are any reciprocal agreements with surrounding states to honor in-state tuition, regional incentives, etc. Students should also be aware of other opportunities for financial support for college such as high school academic awards which may include a monetary award. Guidance counselors and local government officials may also help to identify scholarships offered by charitable organizations such as the Boys and Girls Clubs, and local businesses and community groups such as the Lions Club, Masons, etc. Even some of the USTA sections award small scholarships for college bound players. Sometimes just a simple application for these types of grants can prove to be beneficial. Keep working on your tennis because at the highest levels of collegiate tennis, there are tennis scholarships to gain. If you are at the level to be considered for a full ride, coaches are going to use your demonstrated success in junior tennis as the best indicator of future success with their teams. So while other elements will still come into play in your recruitment (such as future potential for growth in the game, and good character to contribute to a team), the highest level fully funded programs are looking for the highest ranked/rated players that they can get. In working on your tennis, keep good focus on your schoolwork, as well. In many cases, a good player with strong academics may create more opportunities for strong financial packages at a wider variety of schools. Oftentimes, a tennis scholarship may not be as valuable, or generate the same kind of pride, as combining academic and athletic aid. Even if you are not at the level to be considered by a school for a tennis scholarship, do not write off the college tennis experience. Remember that there are many, many opportunities to be a student-athlete at a school of your choice with a level of tennis appropriate for you, and most schools will have an avenue in place to help with the cost of your education if your family will struggle to afford college. In exploring Division 1, 2 3 and NAIA, do some research on junior colleges, as well. Many junior colleges have strong tennis programs where tennis players can go (usually for 2 years) to develop their games in a competitive collegiate setting, and then transfer to a 4 year program, potentially on scholarship. 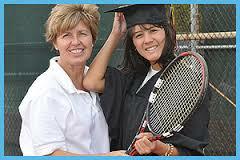 The junior colleges are often less expensive and provide tennis and/or academic aid. It may be a very affordable choice which provides the time, and the developmental academic and tennis setting, to set oneself up for a more lucrative option down the road. International students may face different financial aid options, so doing research and communicating openly with a coach about his/her school’s system will be imperative. At fully funded programs, the process for getting a tennis scholarship will be virtually the same for American and international players. Things may differ when merit aid is involved. Some colleges may encourage expanding the geographical and social diversity and provide merit aid as an incentive international students and student-athletes, while other colleges may have those same goals, yet reserve merit awards or limited financial aid for students coming from the US school system. While the costs of a college education have become astounding, being committed to the sport of tennis within the overall educational experience can make college, and having a collegiate scholar-athlete experience, a meaningful and affordable reality.